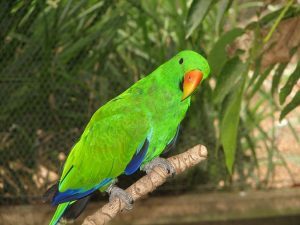 The eclectus parrot is a bird with strikingly vibrant appearance, found in Australia, Makulu Islands, Solomon Islands and New Guinea. 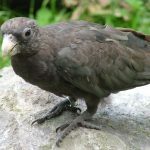 It is unique in the fact that the sexual dimorphism between the two sexes is so much that ornithologists had initially thought that the two were different species. 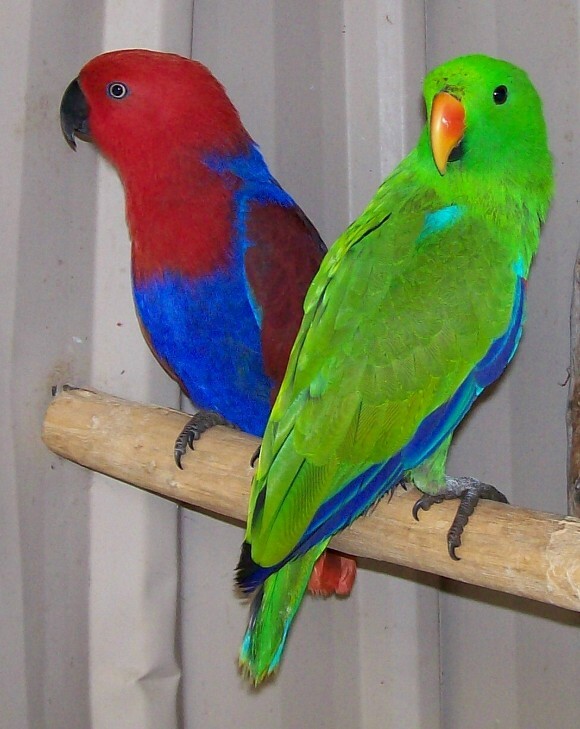 Color Adult male eclectus parrots are bright green with a yellowish tint on the head, the primary wing feathers are blue, followed by red sides and underwings, edges of the tail are a narrow band of creamy yellow, with dark grey and yellow undersides. Tail feathers are green in the middle and become bluish towards the edges. Upper mandibles are corn colored while the lower ones are black. 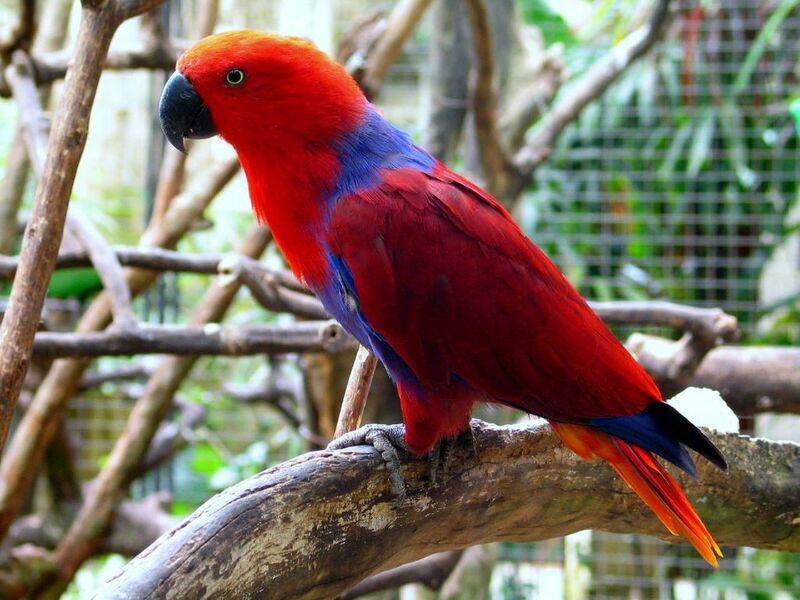 Adult female eclectus parrots are bright red with darker hues on the wings and back. The underwing parts and mantles are purple, while the wings have mauve-blue on the edges. Tails have yellowish-orange edges and the tips are orange with yellow undersides. Beaks are all black. Both sexes have yellow to orange irises at adulthood. 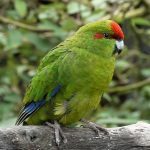 New Guinea red-sided eclectus parrot (E. r. polychloros) – Kai Islands and West Papua in the west, from the island of New Guinea to the Trobriands, D’Entrecasteaux Islands, Louisiade Archipelago to the east. Introduced to the Indonesian Goram Islands. 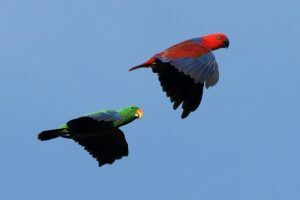 Australian eclectus parrot (E. r. macgillivrayi) – Tip of the Cape York peninsula. 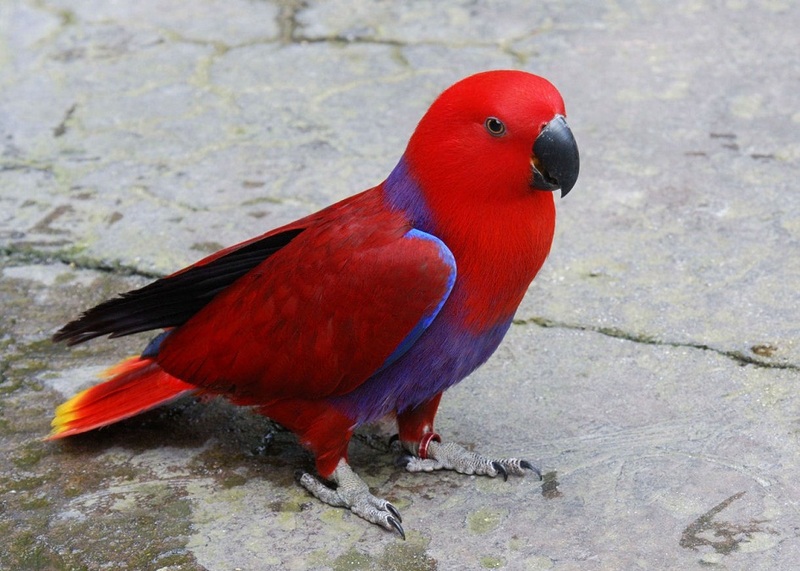 Sounds & Talking: Can an eclectus parrot talk Coos, whistles, squeals, bell and gong sounds. Talking and cognitive ability very high. 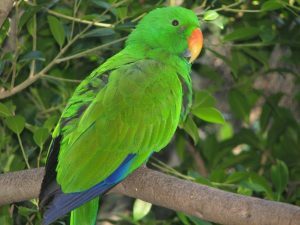 The pleasant personality and entertaining disposition of the eclectus parrot have made it a superstar when it comes to popularity as pets. 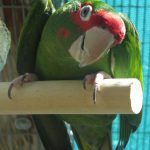 Let’s discuss a few things that need to be kept in mind when owning an eclectus parrot, especially as a first time bird. 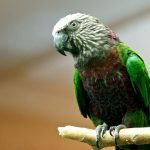 You should get your bird the largest cage that you can afford, and the space in your home can accommodate. This is an active bird which spends very little time of the day in one spot. 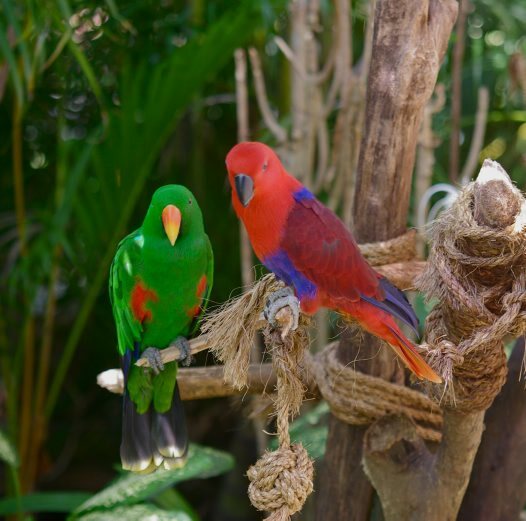 The wingspan of a fully grown eclectus parrot can measure up to 3 ft. so make sure that there is ample room in the cage for the bird to stretch its wings. 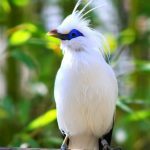 The dimensions should be a cage with a width of 30 ft, depth of 24 ft and length of 36 ft. Let the bird out of the cage daily for exercise and social interactions. Make sure the cage is free from drafts and away from direct sunlight. 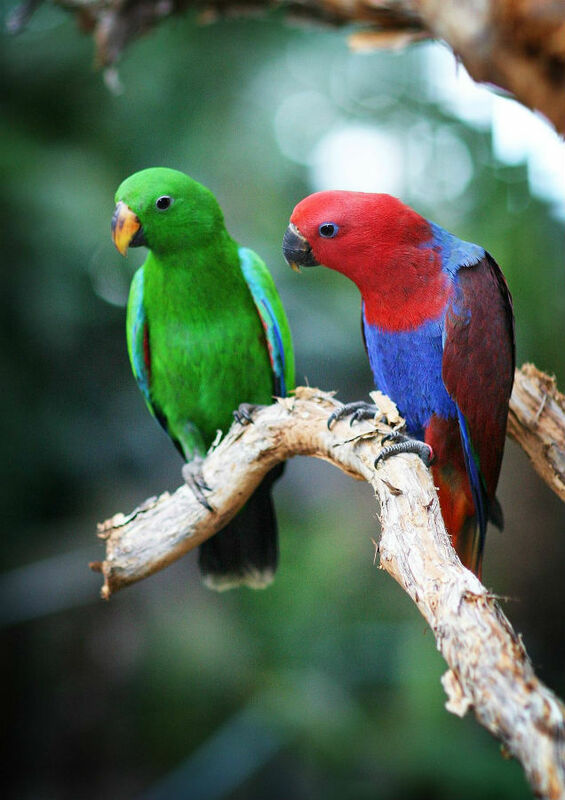 The range of temperature that the eclectus parrot can withstand is between 40°-90° F (4.4°-32°C). The eclectus parrot is an absolute darling when it comes to its temperament. They can develop high cognition of human speech, especially if they are exposed to such from a young age. They are also very inquisitive, which is another reason they have such a vivid understanding of our language. They prefer calm surroundings around them and are quick to notice anything out of the ordinary within that area, and in most cases, you can avoid their rarely aggressive behavior by taking a cue from their body language. Training an eclectus parrot should be done with the help of positive enforcement, and from a young age to get the best results. 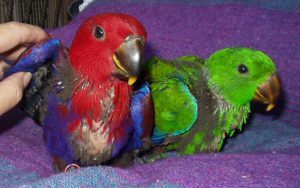 Feed your eclectus parrot a varied diet, consisting of fresh fruits, fibrous vegetables, leafy greens, sprouts, pellets, nuts, cooked chicken legs, and cuttlefish bone. Keep it away from avocado and chocolate, as those could be toxic for your bird. Provide chewable toys, both destructible and non-destructible, for the bird so that it can avert boredom. Bathe it every other day with a spray mist and let it dry itself out under the sun, alternatively, although less preferably, you can use a blow-dryer. Clean the cage regularly to maintain optimum health for the bird. Toe-tapping, this could be a symptom of an unhealthy diet. An eclectus parrot costs between $1,100-$1,700. The digestive tract of eclectus parrots are unusually long, thus necessitating a diet comprising of high fibers. 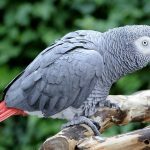 As popular as the bird is at present, it has been misunderstood in the past, being taken for a dull, shy, lethargic and dumb, these, however, are the parrot’s reactions to stress. 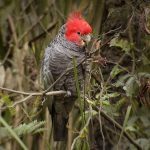 One Response to "Eclectus Parrot"